Since I started using UFO Capture 6 years ago last night's Perseid shower gave me two of the best spectra I have ever recorded! This is absolutely fantastic ! 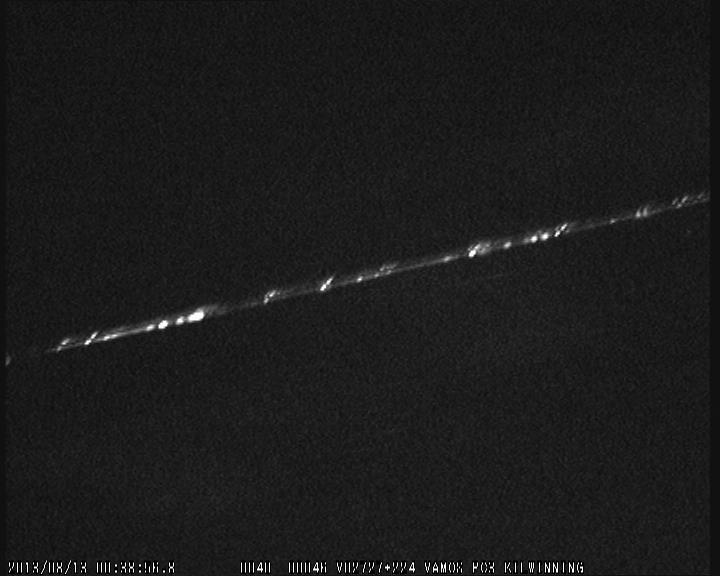 One of the best record of spectrum of a meteor I ever saw! What was the equipment used? But do not compare to your record, the resolution of the spectrum is absurd! Congratulations! It is a really nice close up. 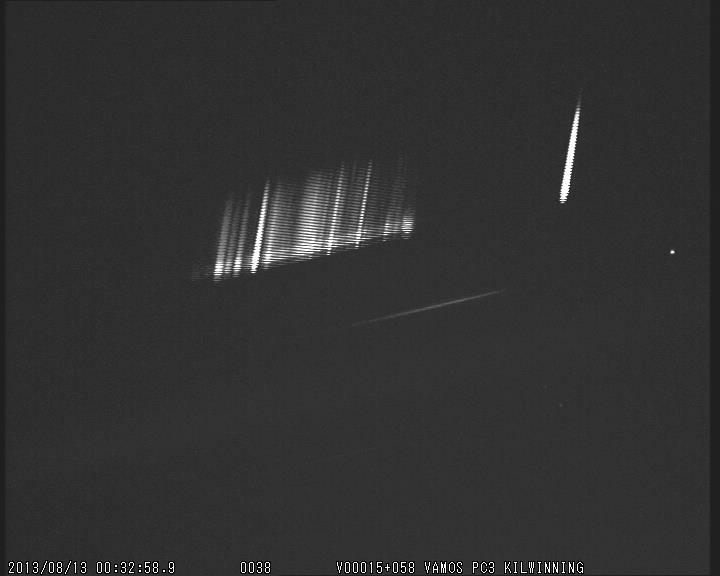 One of the best record of spectrum of a meteor I ever saw! 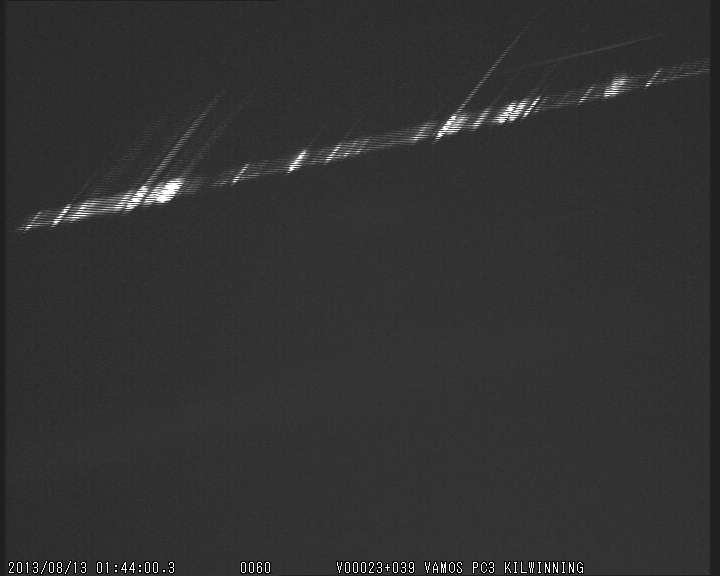 This was a spectrum of earth grazing fireball. See figures below also. Thanks, I was really lucky with these! They're a bit of a cheat though since it is two orders of the same spectrum filling the field of view. About 1/3 of the left side is the 1st order and the other 2/3 to the right are the second order. However it is better than I imagined! The spectrum were captured using a Watec 902H2 Ultimate, 12mm f1.2 lens and a 300 lines per mm blazed grating attached using a home made holder. When I discovered your software it was seeing your spectrum that gave me the idea to try my own video camera for spectroscopy in 2007. Before then I had only ever used still cameras for meteor observing and some spectroscopy (slr since 1983/ccd since 2001 but I never captured a single spectrum!!!). What was the set up you used to get the Delta Aquarid spectrum? It is a lot rarer than Perseid spectrum! Also, do you try spectroscopy often? Hi Bill and Sonotaco ! WOW !!! These are really high level captures !! I'm still far away from them. My intention is to conduct a statistical study of the spectroscopic characteristics of different meteor showers but I have to perform an upgrade on my equipment. The setup I use is a WATEC 902h2 Ultimate with a Fujinon YV2.7x2.9LRD-SA2 lens, where I engage a Star Analyzer grid with only 100 l/mm. 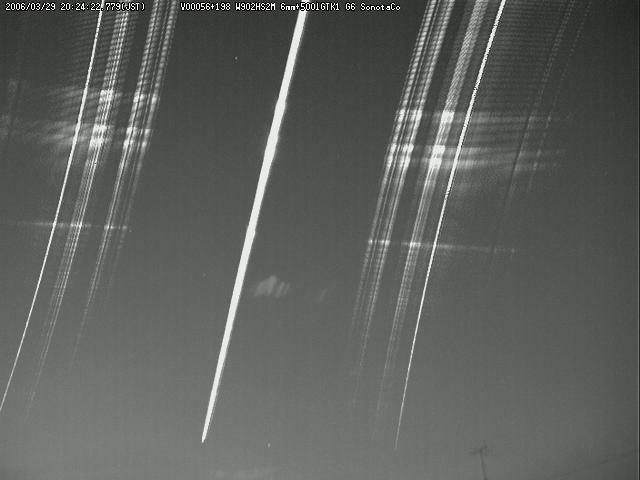 The advantage is to allow a large field with greater chances of catches meteor, but there is too great a loss of resolution. Another problem is that low resolution spectra are high affected by the interlacement artifacts of WATEC camera (as can be seen in my image), I really need higher resolution. I would ask you and mr. Sonotaco what would be the appropriate lens and where to buy a blazed diffraction grating with more lines per millimeter. I'm thinking to test this setup, I think it interesting and with great results. What do you think? Well, there is no good lens for C/CS mount now. The UFOCapture HD is compatible with Canon T3i ? I have been using the same capture set up for a number of years now. This is a Watec 902H2 Ultimate with a pentax 12mm f1.2 lens. The grating is a 300 lpm , 25mm x 25mm from a company called Thorlabs. If you do an internet search you'll find them. They are big optical re-seller and now do on line sales. 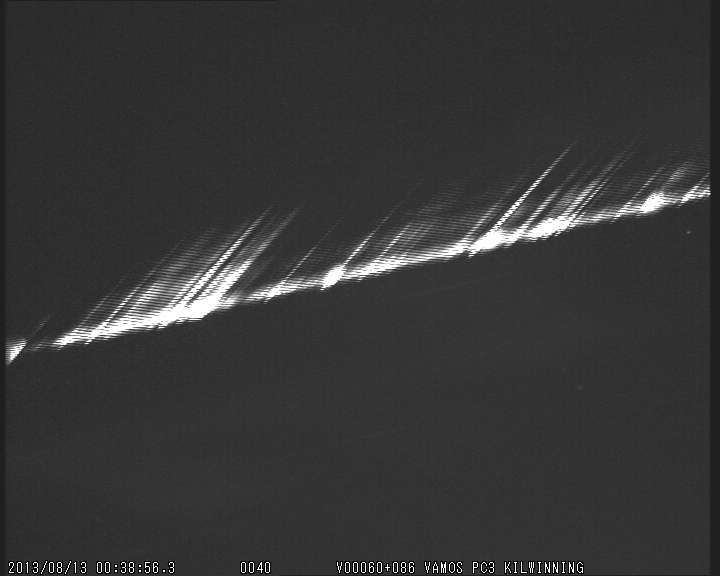 I was at the International Meteor Conference in Poland a few days ago and by conincidence several observers commented that the Edmond gratings were not so good. I've never used one myself so I can't say for sure but it might be worth checking out other suppliers for price/quality. Another company I've used is called Melles Griot but I don't know if they do retail sales. About the artifacts you mention, that is a very good point! This is a problem with all interlaced video type cameras. The dark interscan lines can cause all sorts of problems and can often look like the little bumps of lines in a spectra when they are not. You need to be very careful! Prisms are good because they only give one spectrum BUT the dispersion is not linear. I don't know but I am afraid it is not. Generally HDMI output of DSR has problems like below. I have no succeeded report about HDMI output of Canon T3i. - HDMI video is not outputted while live viewing (it is just for play back) -- most of compact cameras. - Live view output is not HD. - View area is smaller than 1920x1080 (having black frame) -- Canon EOS 6D. - Live view shut downs automatically in short time (5 or 10 minutes). - Information overlay on the video cannot be erased. - Video format is not stable. See images below about Canon EOS 6D. the Edmond gratings were not so good. I agree for polyester film ones that I am using . They are very low cost products for education. My comment about the Edmond grating was not well worded. The other guys were speaking about the blazed glass gratings not the polyester film. I've never used an Edmond glass grating but I've used the polyester film myself for a long time exactly because it is inexpensive and you can cut it to size for larger lenses. The cost of a large glass grating would be very high! Whilst inspecting the de-interlaced frames from one of my spectra I discovered something quite unusual. Towards the end of the meteor ablation the spectrum seems to decompose into two distinct spectra with different lines in the upper and lower sections. I was wondering if anyone has any other examples of this or is it a unique effect?